San Pedro del Pinatar and nearby Lo Pagan are not particularly famous despite their proximity to the tourist hotspot of Torrevieja. Located just a few miles down the coast and into Murcia, it’s a must see sight for the birds in and around the salt lakes, plus an opportunity to wallow in its glorious mud. There are pools of water with a thick layer of slimy mud at the bottom which is rich in all sorts of minerals to cure your ailments. On a sunny day you will see many people slapping it on then drying out in the sun. Some even walked around caked in mud. It was a curious sight indeed. 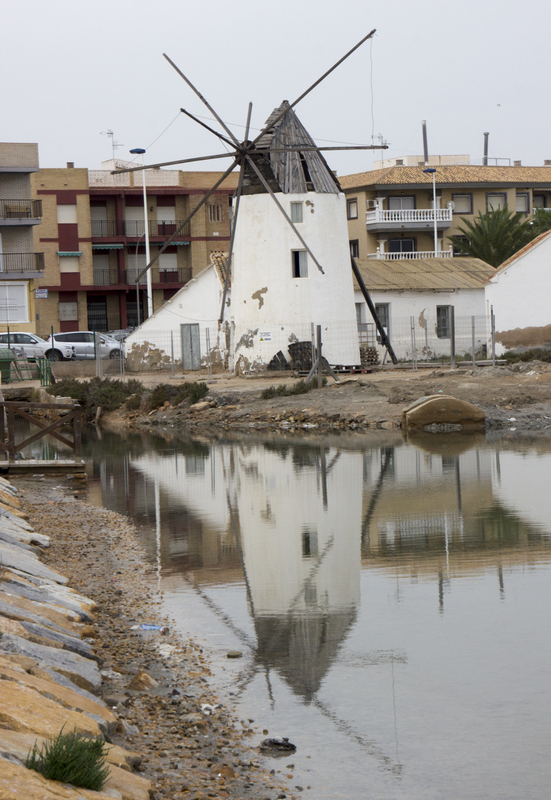 You can also walk for miles on a spit out into the Mar Menor admiring the wildlife and the decrepit windmills. With bicycles you could go much further. 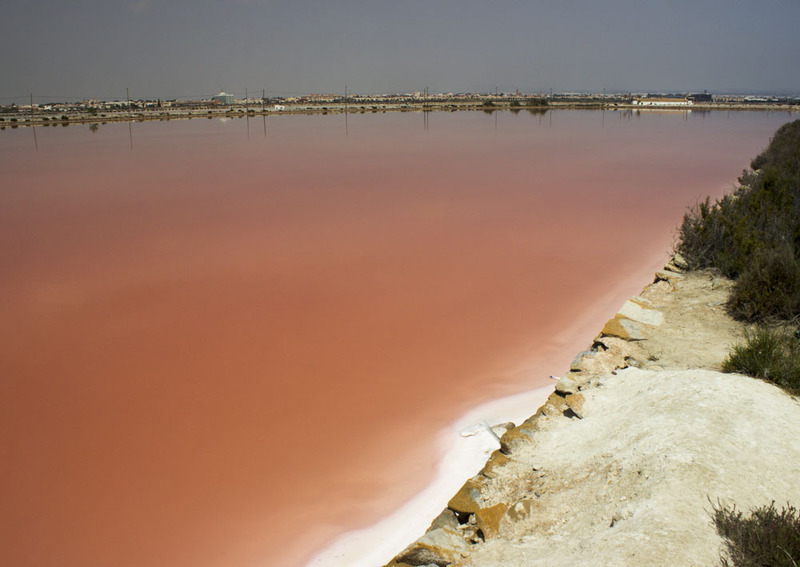 Don’t leave without having a closer look at the salt lakes. The giant mounds of salt at the side are an unusual sight in themselves, but when you see them next to a rich red lake, presumably coloured by rich minerals, it is extraordinary. In some of the less salty pools you can get up close and personal with flocks of flamingos. To get so near to them is an amazing experience. On a windy day, don’t be surprised to see some kite surfers and wind surfers braving the seas. If you can stand getting battered by the breeze, they can be quite entertaining to watch for a while. 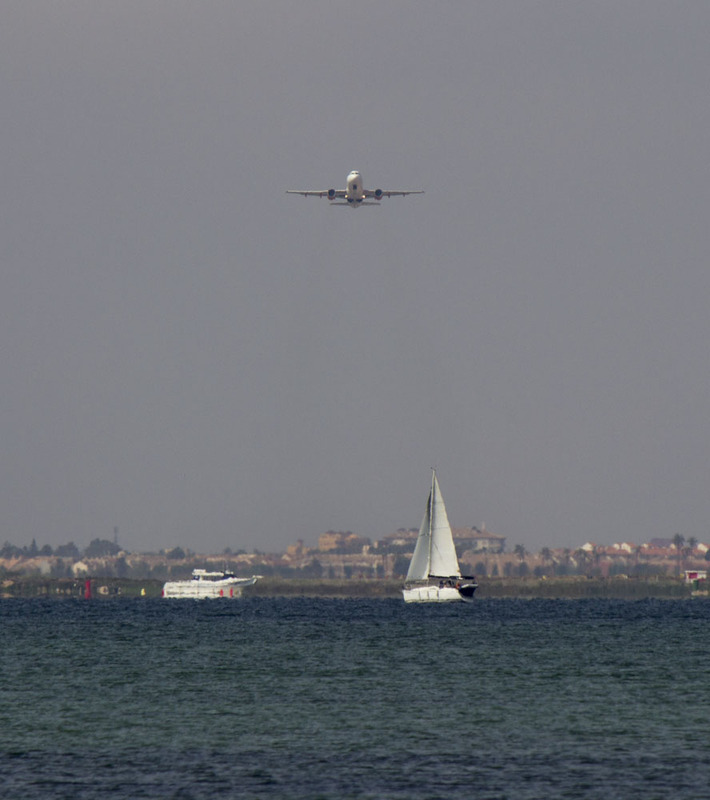 And if you are an aircraft spotter, San Pedro del Pinatar is ideally positioned to see the planes landing and taking off (depending on the wind direction) at Murcia’s San Javier airport. Get there quick before the new airport opens! Good one Russ. Another good point of information – walk along the promenade towards Los Alcazares, and make a pit stop at Casa Miguel. Order a drink, and enjoy the big plate of Murcian Salad that comes out with it. First time we went there, we thought they had misunderstood and thought we were eating, but that’s what you get with every drink, and it’s fabulous. Good tip Sandra. Thanks. Will definitely make a note of it for next time.